Bring simple elegance to your outdoor landscape with the Arboria Berkeley Cedar Arbor. 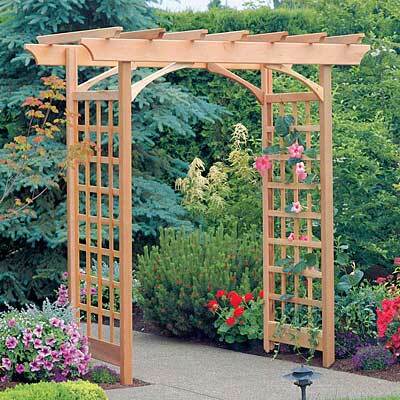 Made from Western Red Cedar for exceptional durability, this structure stands 87" at its tallest, and the opening adjusts to widths between 48.5" and 60.5" to suit your needs. Gracefully curving corner braces connect the sides to the roof of this grand arbor. The Western Red Cedar construction contains natural oils that retard decay and repel insects and fungus; it also has low shrinking and swelling tendencies and superior ability to hold paint. Furniture-quality craftsmanship and no-rust aluminum staples ensure that this arbor has the utmost strength and resilience. Let the stately presence of the Berkeley Cedar Arbor support your foliage and add architectural interest to your lawn or garden. Galvanized mounting stakes and instructions included. Assembly required. Made in the USA.